€180 Million Facility Slated to Begin Operations in 2020 and Create 900 New Jobs. HALLE AN DER SAALE, Germany — Together with leaders from customer Schaeffler’s Automotive Aftermarket Division, Neovia Logistics, a global supplier of logistics services, celebrated the laying of the cornerstone for Schaeffler’s Aftermarket Kitting Operation (AKO) in Halle an der Saale, Germany on June 14th. 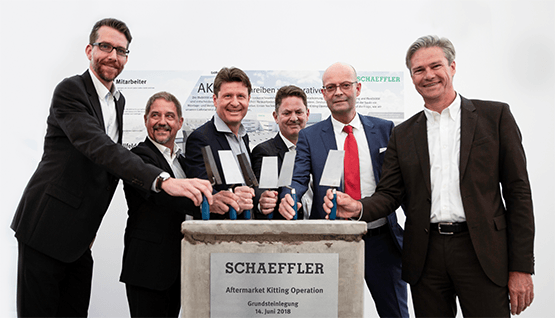 Local dignitaries and members of partner companies, including construction partner GSE and automation partner Dematic, also participated in the event to celebrate the planned facility, which Neovia will operate on Schaeffler’s behalf. The €180 million state-of-the-art aftermarket kitting facility near Leipzig will feature industry-leading innovations, occupy over 40,000 square meters and house Schaeffler’s inventory of automotive aftermarket spare parts and repair solutions. Creating over 900 jobs, the operation will assemble and package several million repair kits from 40,000 different SKUs annually. Operations are slated to begin in 2020, with Neovia managing day-to-day operations at the facility. Neovia will support Schaeffler in their efforts to generate sustained improvements in quality of delivery and provide faster, more reliable and more flexible service to customers. Over 40,000 articles for passenger cars, light and heavy commercial vehicles, and tractors will be commissioned, packaged and dispatched at the facility. Brands include LuK, INA, FAG and Ruville, and products include clutch and clutch release systems, engine and transmission applications and chassis applications. “We are excited to celebrate this milestone with Schaeffler and take another step forward in our partnership,” said Neovia Chief Commercial Officer Sven Hoemmken, who attended the ceremony. “We look forward to delivering meaningful results and an exceptional customer experience to Schaeffler and its aftermarket customers.” Photo: Schaeffler AG. From left to right: David Werth, Director Strategic Supply Chain Management, Schaeffler Automotive Aftermarket GmbH & Co. KG; Michael Junker, President Operations & Supply Chain Management, Schaeffler Automotive Aftermarket GmbH & Co. KG; Sven Hömmken, Chief Commercial Officer (CCO) Neovia Logistics; Pat Olney, CEO Neovia Logistics; Dr. Bernd Wiegand, Mayor of Halle (Saale); Michael Söding, CEO Automotive Aftermarket, Schaeffler AG.